"Chicago Heights" redirects here. For the film, see Chicago Heights (film). Location of Chicago Heights in Cook County, Illinois. Chicago Heights is a city in Cook County, Illinois, United States. The population was 30,276 at the 2010 census. In earlier years, Chicago Heights was nicknamed "The Crossroads of the Nation". Currently, it is nicknamed "The Heights". ✪ Chicago Heights Police Department along with the Illinois State Police Gang Suppression Unit. Chicago Heights lies on the high land of the Tinley Moraine, with the higher and older Valparaiso Moraine lying just to the south of the city. According to the 2010 census, Chicago Heights has a total area of 10.083 square miles (26.11 km2), of which 10.07 square miles (26.08 km2) (or 99.87%) is land and 0.013 square miles (0.03 km2) (or 0.13%) is water. The city's major crossroads are at Dixie Highway (Illinois Route 1) and Lincoln Highway (U.S. Route 30). Chicago Heights is about 30 miles (48 km) south of the Chicago Loop. As of the census of 2010, there were 30,276 people, 9,587 households, and 7,077 families in the city. The population density was 3,003.6 people per square mile (1,160.0/km²). There were 11,060 housing units at an average density of 1,097.2 per square mile (423.8/km²). The racial makeup was 38.0% White, 41.5% African American, 0.6% Native American, 0.4% Asian, 0.03% Pacific Islander, 16.6% some other race, and 2.9% from two or more races. Hispanic or Latino of any race were 33.9% of the population. There were 9,587 households, out of which 44.4% had children under the age of 18 living with them, 40.0% were headed by married couples living together, 26.0% had a female householder with no husband present, and 26.2% were non-families. 22.1% of all households were made up of individuals, and 8.2% were someone living alone who was 65 years of age or older. The average household size was 3.09, and the average family size was 3.62. The population was spread out with 30.7% under the age of 18, 10.6% from 18 to 24, 26.4% from 25 to 44, 21.8% from 45 to 64, and 10.6% who were 65 years of age or older. The median age was 31.2 years. For every 100 females, there were 95.9 males. For every 100 females age 18 and over, there were 90.6 males. For the period 2009–11, the estimated median annual income for a household in the city was $43,941, and the median income for a family was $46,463. Male full-time workers had a median income of $35,695 versus $30,039 for females. The per capita income for the city was $17,548. About 21.3% of families and 26.7% of the population were below the poverty line, including 39.8% of those under age 18 and 10.2% of those age 65 or over. Chicago Heights School District 170 operates eleven schools, with a student population of 3,600. Highland is the district's pre-school for children aged three and four; Garfield, Grant, Greenbriar, Jefferson, Kennedy, Lincoln, Roosevelt, Washington-McKinley, and Wilson are neighborhood schools that serve students from kindergarten through eighth grade. In 1901, the Board of Education decreed that the school day would run from 9:00 a.m. – 12 noon, and from 1:00 p.m. – 4:00 p.m. with a 15-minute recess each session. On July 30, 1903, the first telephone in School District 170 was placed in the office of the Superintendent of Schools at a cost of $18 per year. In May 1907, School District 170 students collected money for victims of the San Francisco earthquake. On October 1, 1908, telephones were ordered for Garfield and Franklin Schools, the first schools to have access to "this marvel of communication". In 1912, the Board of Education decreed that non-resident students "shall pay tuition in advance, at the rate of $2 per month" and required all its teachers to live in the district. In December 1912, the Board of Education voted to authorize a reward of $10 for "evidence that will convict any parties who willfully deface or destroy school property." In 1913, School District 170 served 2,238 students. In January 1917, the Board of Education authorized the installation of electric gongs in three schools. In January 1917, the Board of Education endorsed a nationwide "Plan for Preparedness", setting aside specific times for girls and boys to drill under the supervision of a member of the National Guard. From October 22 to November 14, 1917, District 170 schools were closed because of an influenza outbreak. In 1919, the average enrollment of students per classroom was 44; in 1953, the average enrollment of students per classroom was 30; and in 2002, the average enrollment of students per classroom was 20. In 1953, School District 170 served 2,833 students, and in 2004 the district served 3,550 students. Chicago Heights is home to Bloom High School, which all students of District 170 attend after 8th grade, and Bloom Trail High School, which shares its athletic programs with Bloom. Many students from neighboring communities including Steger, South Chicago Heights, Ford Heights, Sauk Village and Glenwood attend high school at Bloom. Parts of Chicago Heights are included in Flossmoor School District 161 which includes Serena Hills Elementary School in Chicago Heights. After Serena, students attend Parker Jr. High School—also a part of Flossmoor School District 161. Only some students who went to Parker Jr. High School move on to Homewood-Flossmoor High School; the rest attend Bloom High School. Parts of Chicago Heights are also served by Park Forest – Chicago Heights School District 163, and Beacon Hill Primary Center is located in the Beacon Hill neighborhood. Students from this neighborhood attend Rich East High School, part of Rich Township High School District 227. Marian Catholic High School is a private high school located in city. Prairie State College is a community college located in Chicago Heights. There are also many elementary schools that operate at church locations. On May 20, 1901, many Chicago Heights residents signed a petition asking for the mayor and aldermen to select a board of directors that would be responsible for founding and running a free public library in Chicago Heights. On June 28, 1901, the first library board members were sworn in, including Sam W. Lea, F.W. Schact, W.E. Canady, James Bowie, David Wallace, Joseph Caldwell, C.W. Salisbury, A.J. Sorensen, and A.W. McEldowney. The library was opened in a small room in the new city building on February 20, 1902. That month, the library board wrote to industrialist Andrew Carnegie seeking funds to build a library building in Chicago Heights. In July, the board was notified that Carnegie had proposed $15,000 toward the cost of a library building as long as the city could provide a free site for the building and if the council could promise $1,500 a year to keep the library running. The Carnegie Library in Chicago Heights was designed by Richard E. Schmidt. The library was located at 1627 Halsted Street and opened on September 11, 1903, with a staff of two and 1,643 volumes. A bigger library was eventually needed, and on August 5, 1972, the present building at 15th Street and Chicago Road was opened. The Chicago Heights Free Public Library was a million-dollar building that opened with 60,000 books, records, and other materials. Chicago Heights was once home to a number of major industrial concerns, including the Thrall Car Manufacturing Company, manufacturer of freight cars, run for many years by chief executive officer Richard L. Duchossois. The city was also the original home of the Inland Steel Company. Ford Motor Company operates a metal stamping plant located along Lincoln Highway in Chicago Heights. This facility produces automobile body panels that are shipped to Ford's Chicago Assembly plant approximately 15 miles (24 km) to the north in the Hegewisch community area of Chicago. Chicago Heights is served by six Pace bus routes and the Pace Chicago Heights Terminal. There was a Well Group Clinic (part of St. James) located on Dixie Highway. Well Group was previously known as Suburban Heights Medical Center. There are also two Aunt Martha's health centers in Chicago Heights. In September 2018, St. James Hospital closed after more than 100 years. ^ "Geographic Identifiers: 2010 Demographic Profile Data (G001): Chicago Heights city, Illinois". U.S. Census Bureau, American Factfinder. Retrieved February 8, 2013. 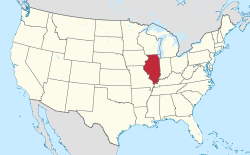 ^ "Chicago Heights Illinois Profile and Resource Guide, City or community of Chicago Heights, Illinois Facts, Information, Relocation, Real Estate, Advertising". www.usacitiesonline.com. Retrieved March 26, 2018. ^ "G001 - Geographic Identifiers - 2010 Census Summary File 1". United States Census Bureau. Retrieved 2015-12-26. ^ Candeloro, Dominic. "Chicago's Italians: A Survey of the Ethnic Factor, 1850–1990." In: Jones, Peter d'Alroy and Melvin G. Holli. Ethnic Chicago: A Multicultural Portrait. Wm. B. Eerdmans Publishing, 1995. p. 229–259. ISBN 0802870538, 9780802870537. p. 229. ^ a b c d "Profile of General Population and Housing Characteristics: 2010 Demographic Profile Data (G001): Chicago Heights city, Illinois". U.S. Census Bureau, American Factfinder. Retrieved February 8, 2013. ^ "Selected Economic Characteristics: 2009–2011 American Community Survey 3-Year Estimates (DP03): Chicago Heights city, Illinois". U.S. Census Bureau, American Factfinder. Retrieved February 8, 2013. ^ "Rich Township District 227". ^ "Pace Bus". www.pacebus.com. Retrieved March 26, 2018. ^ "Locations". Aunt Martha's Health Center. Archived from the original on January 26, 2011. ^ "St. James Hospital Slated To Close Soon". Patch. ^ Pope, John (July 14, 2011). "John Mosca, owner of the landmark restaurant bearing his name, dies at 86". The Times Picayune. Retrieved July 28, 2011. Wikisource has the text of the 1921 Collier's Encyclopedia article Chicago Heights.